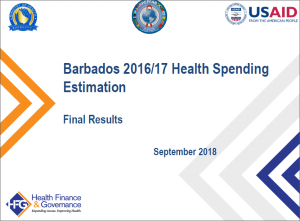 Resource Description: Over the past five years, Barbados has been grappling with economic challenges while trying to provide universal health coverage for its population. At the same time, an aging population, rising incidence of non-communicable diseases, and the population’s desire for new and innovative treatments are contributing to increased health care costs. In addition, the country’s income level makes it ineligible for concessionary lending from multi-lateral institutions and Global Fund for AIDS, Tuberculosis and Malaria (GFATM). These challenges are putting an increasing strain on a tax-based system for financing health care, where health spending fluctuates according to government revenues, with gaps being funded by households out of pocket. The Ministry of Health and Wellness (MHW) needs sound health financing data to identify options to address the challenges highlighted above and to monitor whether policies are achieving their intended objectives. In this context, in 2014 Barbados conducted its first Health Accounts for fiscal year 2012/13. The intent was to understand, for example, who was funding health care and how that spending was used. For the HIV response, the ministry wanted to understand HIV spending to effectively plan for the upcoming reduction in external support, and to inform its HIV Sustainability Plan. Since the 2014 Health Accounts, significant changes have created a need for updated information on health expenditure. USAID’s Health Finance and Governance project (HFG) supported the MHW in 2018 in conducting a high-level estimation of health expenditure to provide an update to the 2012/13 Health Accounts. These results will be used by the government to make evidence-based decisions on health financing, including to inform the HIV Sustainability Plan.